Saxophonist Kris Brownlee collaborates with legendary guitarist Freddie Fox and Grammy Award-winning producer Michael Broening on Brownlee's third album, entitled Sincerely Yours. 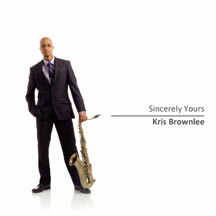 Brownlee often plays multiple instruments on each album track, and the accent-filled grooves are getting radio airplay. With a degree in music performance and psychology from Manchester College in Indiana, Kris Brownlee has played with the likes of blues artist Willie Kent, former Duke Ellington saxophonist Stephen Foster, and internationally known trombonist Jiggs Whigham. "Over the past 25 years of playing, I've been influenced by many, but none more than by saxophonist Boney James," Brownlee said.